The wind gust came out of nowhere. I lifted my hand to free my tangled hair from my pearls and clumsily broke the strings in my haste. Pearls sailed everywhere and pelted my heart like hailstones. Supplies are still packed in boxes! This is another paper bag with paint, a number 2 pencil and color pencils. Yup, done at the table! what a beautiful illustration, and on a paper bag no less. I'm very impressed. Great work. I am so impressed with the visual pictures that you paint with your words!! ... and what you can do with a paper bag... amazing! Oh I hate it when that happens. I am glad that each pearl is knotted. My pearl necklace broke and has to be restrung. I love the woman's hair. It l;ooks like she uses a good shampoo and conditioner. She also has very nice lips. Blogger won't let me sign in. Isn't that wonderful! Goes to show that art can be done if you set your mind to it, no matter the conditions! This is really neat...I love it! These pieces of paperbag fine artwork is turning into an amazing series. You have got to keep going on this, they are truely wonderful! Your bag art is so fun! Great idea for strings. You're really good at these Laurel! Love the angle and hair rendering. Another brilliant paper bag painting! This is so beautiful - and such a poetic idea. I really love these works on brown paper - dreamy and inspiring and really lovely! Some of the best work is done under limited conditions, and you are showing us how that can be done. I'm pretty impressed friend! Hope all is well,...it's been a busy and frantic week around here, bike riding was the highlight! Well, Kiddo, you've done it again. If IF ever gives Illustration of the week to someone twice it will be you. This is an amazing take on the word and and equally impressive illo. Bravo! Scattered pearls on the Boulevard of Broken Dreams...a beautiful composition. Oh, this is great. Has a great feel and I love the materials. As usual, another wonderful piece. Great ideas! So amazingly beautiful! omg, lollie...this is so beautiful. i love the tension in her face, the pearls....just stunning. I think you're flying since you settled at that table. I great shifting of gears. Beautiful illustration and words! I love your works on paper bag, strongly feel some story hiding behind them! Some people (like me) wait for the right time, place, pencil and pad to sit down and try to make art. Some people (like you) just sit down and do it. I wish I were more like you. My day would be SO much more better and brighter if your art were on all my brown paper bags. Exquisite and poetic! i adore the stories you weave with your illustrations. they are really very good. great stuff again. The brown paper is amazing. Love your words and illustration! applause! I am really liking your paper bag illustrations. i think you are quite onto something there! I have always found that drawing on paper bags was liberating. Nice work. I particularly like the sugar illustration. Beautifully drawn. this is the first time i visit your blog and i am so glad that i have visited you. Your illustrations are very reflective and subtle. Your paintings with your words are impressive. Last blogger I know your type of genre is soulbrush and i like you both. I can see how this scenario would be quite the disaster! The use of the paper bag is an inspired choice of surface. ooooohhh! me encanta! que curiosa es. It's so dynamic, I can almost see this illustration as a slow motion sequence. Fantastic use of a simple paper bag, its color and texture really enhances your art. beautifully done! thanks for your comment on mine! What a great take on the topic! Fully of whimsy - and letting go is what I see. Love the lines and strings in this piece. Yep, I'm going to have to also go along with the others on loving the paper bag art as well. Just love how the image jumps right off it. Thanks for your comments everyone! I'm really enjoying my limited supplies at the moment. Get Zapped and Sketched Out: You're right, I was going for a feeling of loss here. 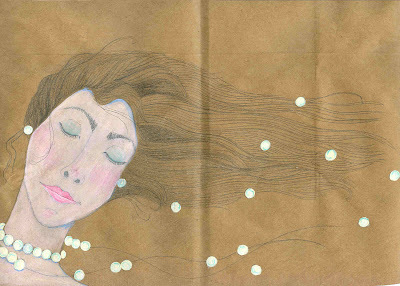 The man who gave her those pearls is no longer with her, so when the pearls broke and were scattering in the wind it was breaking her heart all over again. I was searching poetry sites for the right words when my husband said "Anything you write will be better than trying to match it to someone else's words." So, I thank him for the encouragement! This is so beautiful. True creativity comes when you can use anything handy. I love those pearls! Wow reminds me of a Moleskine. Love it! You should frame it... or sell prints of them to cover text books. Do people still do that?